As with the Penguin and Scarecrow before, Gregg Hurwitz pens a cogent new origin and caper for the Mad Hatter, with appropriately creepy art by Ethan Van Sciver (for the most part). Surely Batman: The Dark Knight Vol. 3: Mad is a book other writers should come back to as an example of how to write the Mad Hatter as a credible threat. Hurwitz's new take on the Hatter works, though it isn't my ideal for a Bat-villain origin (just a difference of opinion). Aside from that, my nitpicks at Mad are mostly secondary in nature -- that I don't think an artist switch-up here quite works, and that continuity, when it intrudes, does so clunkily; I might have a few issues with how the story is told but not with Hurwitz's story itself. Hurwitz and Van Sciver fire mostly on all cylinders through the first three chapters of this book (which collects in total issues #16-21 and the Annual #1). Hurwitz conceives of the Hatter somewhat in the same way Gail Simone portrayed the new Ventriloquist and dummy in Batgirl Vol. 4: Wanted -- this diminutive, innocuous-looking but also kind of creepy gremlin figure, who seems harmless until wham! he's gouging someone's eyes out or shooting them in the head. There's plenty horror movie precedent for a figure of this type, and Hurwitz's emphasis on the Hatter's violent unpredictability gives the villain a serious edge that he's lacked before. I had some hesitation previously toward picking up the purposefully-continuity-light Mad, but I'd lately had a craving for a Mask of the Phantasm-eseque Batman-movie-type story, and Mad seemed to fit the bill (and that my library had a copy didn't hurt). Indeed Hurwitz gets the "Bruce Wayne considers revealing his identity to his girlfriend and giving up the vigilante life" trope just right; it is a trope, but one with a long history in the Bat-mythos and that works especially for a "disconnected" book like this (except where it doesn't; more on that later). In all Mad has the trappings of a fine Batman movie, or at least an extended animated episode. Hurwitz solidified his reputation in the second volume, Cycle of Violence, with his story of Batman literally bleeding himself dry to save Gotham). Aside from making the Mad Hatter a credible threat, Hurwitz includes plenty of other clever bits here -- a funny take on Batman always leaving Commissioner Gordon mid-sentence, and Penguin depanning "I believe they call that irony" when the Scarecrow is frightened by a Bat-scarecrow in the annual. There's also an off-the-cuff conversation between Batman and Tweedle-Dee in which Dee takes Batman to task for what might be considered excessive force; this was both an unusual comeuppance for Batman and an unusual take on Tweedle-Dee, and I thought both comported Hurwitz well. Hurwitz also positions Alfred and Commissioner Gordon as the angel and devil on Batman's shoulder, driving him to be Batman less and more respectively, which I felt hadn't been presented quite this way before. Once again, however, Hurwitz gives us the origin of a Bat-villain rooted in childhood trauma. Arguably the Hatter traumatizes himself, as opposed to the Scarecrow's abuse at the hands of his father, but still it seems repetitive. I get at the same time that this is Hurwitz's "thing" for Dark Knight and also that Batman himself is a product of childhood trauma, but still it felt predictable. Also, whereas it's immensely clever that Hurwitz posits that the Hatter gets "powers" from his ever-present tea, I didn't necessarily need Hatter to be able to go toe-to-toe with Batman, as is suggested at one point, for the Hatter to be threatening; rather the Hatter in fisticuffs with Batman seems somewhat ludicrous. I don't mind a villain like the Hatter battling Batman simply with esoteric clues and booby-traps; in making the Hatter steroid-crazed, Hurwitz evokes Bane, of all characters. All of this detail, in my opinion, takes away from the real weirdness of the Hatter: just a disfigured scientist gone bad with an Alice in Wonderland fixation. In finding the causes for the Hatter's behavior in his childhood and drug-use, I felt Hurwitz made the Hatter counterintuitively more normative, and less unique. Mad moves along well as a continuity-light story; really the only way to believe Natalya Trusevich as a significant-enough girlfriend for Bruce to reveal his identity is to take this as separate from the other Bat-titles and take for granted her lack of appearances or influence anywhere else. The story stumbles, however, in issue #20, with a rather heavy-handed reference to the death of Robin Damian Wayne. Now we're supposed to believe that Bruce has been dating Natalya, up to and including considering revealing his identity, all the while he's been fighting Talia al Ghul and mourning Damian, and then he's still going through with it? Batman's actions in the story work sans Damian, but with Damian's death the logic goes out a bit. As well, that the Hatter subsequently kills Natalya would be fine for the story, but with Damian's death it seems really a hurt too far for Batman and the reader, especially since the other Bat-titles will generally ignore all of this (though Van Sciver's single panel where Batman sees Natalya's body on the Bat-signal is maybe the most expressive and touching of the book). The book's real difficulty, however, is in the art as a package. Van Sciver's art is quite fine; I don't always favor his style but the straight-edge lines and over-detailing work for the Hatter in this piece. I also accept the appropriateness of Hurwitz's Penguin: Pain and Prejudice artist Szymon Kudanski filling in, but Kudanski's style is so different from Van Sciver's that it's jarring going from one to the other in the same story, like reading two different books. With both artists, it's sometimes difficult to tell where Batman is, and both artists vary too much how short or tall the Hatter is in various panels. Van Sciver, in the second chapter, has Batman seemingly grappling downward to a bottom panel when actually he's gone up to the roof; at times the action in Kudanski's panels don't match what the characters are saying or doing in the script. Also the book has technical difficulties -- Natalya's skin colored differently here than in Cycle of Violence, and creative team credits on the page at the beginning of each issue unnecessarily. The annual functions to close out the book in that it features Hurwitz's three prominent characters so far -- Penguin, Scarecrow, and Mad Hatter -- and uses details from each of their stories. But again, some of Kudanski's art is entirely inscrutable here, and also it's a one-off Halloween tale without much content; if I were a single-issue reader I'd feel cheated having paid extra for an annual story that could really fit in fewer pages in a DCU Halloween special. The comical tone also feels a little off, undercutting as it does the "tough Hatter" story we've just read by presenting the character as comic relief again. 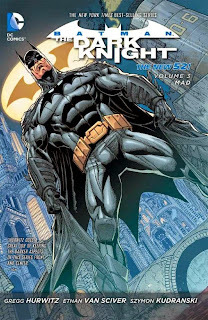 For a casual Batman reader or, as I said with Cycle of Violence, maybe someone who wants to take a Batman book on a plane ride, I would recommend Batman: The Dark Knight Vol. 3: Mad. Inasmuch as classic Mad Hatter stories are few and far between, Gregg Hurwitz achieves one here, and I do like Hurwitz's more serious approach to the character. Again, the details of the book are really what give me pause, the art and the continuity misstep, and not the overall interesting story. Later this week, Nightwing Vol. 4: Second City. Don't miss it!